Naturally Jes: 100 of You! Oh my, goodness. Where do I even begin? I’ll start off by saying: If you follow me on Instagram you may already be aware that just last Tuesday I reached 100 followers on Bloglovin’! To some of you that may not be a lot, but to me that’s more than what I ever imagined. I don’t even know how to thank you enough for coming along on this journey with me, for supporting me and allowing me to grow into somebody I am actually proud of. You may not know it, but you are a big part of my life and I can’t thank you enough for just being there and reading what I have to say through my little corner of the Internet. And that’s all I really wanted to say for now. Short, but sweet. Also, I just quickly wanted to mention and confirm that I have noticed my absence this month on my blog. I do have a valid explanation, which I think I will share another time. I feel like it deserves it’s own separate post and believe me… I can’t wait to share with you all what has been happening this month! Congrats!! It's so exciting to see your numbers go and feel like your writing and creativity that your putting out into the universe is enjoyed- congrats!! 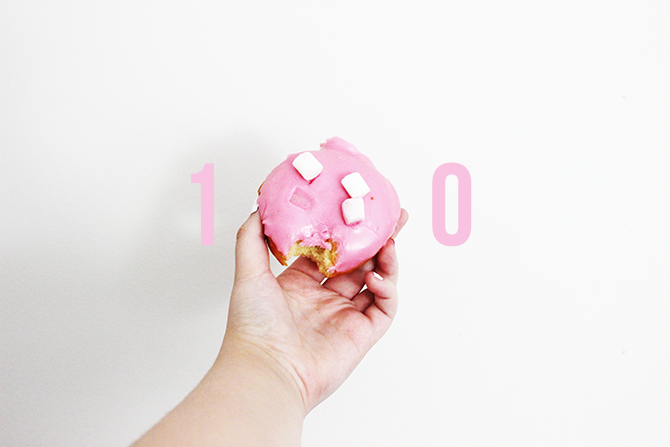 Congratulations on reaching 100 followers, I love to see other bloggers being rewarded for the hard work they put in! Also this donut is so perfect? haha it reminds me on the animated ones on the Simpsons! Yay! So happy you reached your goal and so happy that your blogs is growing. Congratulations! It's so cool that you've reached your goal. Now you can make a new goal for your blog and I'm pretty sure you will reach it as well! Congratulations!! Such a great achievement, and to be honest just managing to stick it out and keep blogging is an achievement in itself! Here's to the next 100! Congratulations!! keep it up. I hope you gain so much more followers this year because you deserve it your blog is lovely. (You just gained another follower haha x) I'm on your blog for the first time but I will probably visit more often now, because it's so lovely.